Definition - What does Parivrtta Sukhasana mean? Parivrtta sukhasana is a simple beginner seated pose with a twist. 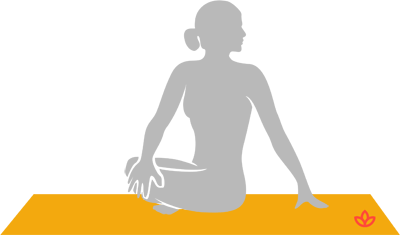 Beginning in sukhasana – seated with legs crossed and the spine perpendicular to the ground – the yogi brings one hand to the outside of the opposite thigh and twists the upper body in that direction with the gaze over that shoulder and the other hand outside its corresponding hip. The name of this asana comes from the Sanskrit parivrtta, meaning “revolved”; su, meaning “good”; kha, meaning “space”; and asana, which means “posture” or “pose.” Sukha is often translated as “easy”; hence the English name for this pose: revolved easy pose or simple twist pose. As a twisting pose, parivrtta sukhasana is believed to open the manipura (navel or solar plexus) chakra. This chakra, or energy center, is associated with personal transformation and power. Activating manipura boosts self-esteem, confidence and motivation. Like sukhasana, parivrtta sukhasana also is thought to balance the anja (third-eye) chakra, which is associated with intuition and promotes difference perspectives. This spiritual chakra leads to deeper understanding and inner knowledge. In addition to physical benefits like increased flexibility, the pose also releases tension, thereby reducing stress and anxiety.